(Central Islip, N.Y., July 2, 2018) – The Atlantic League of Professional Baseball today announced the rosters for the 2018 Atlantic League All-Star Game, presented by Good Samaritan Hospital Medical Center. 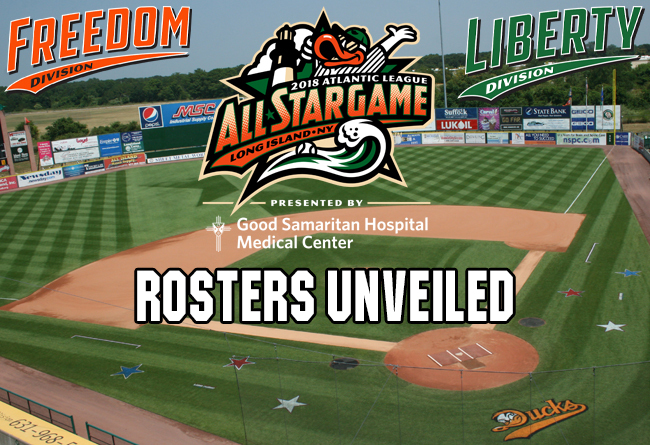 Representatives from the Liberty and Freedom Divisions will square off in the league’s 21st annual All-Star Game on Wednesday, July 11th at Bethpage Ballpark, the home of the Long Island Ducks, with first pitch scheduled for 6:35 p.m. Both squads will feature 22 players, including 13 position players and nine pitchers (rosters at end of this story). Players were chosen by a combination of fan voting, and balloting of league officials, team executives, club managers and media representatives. Nearly 35,000 ballots were cast by fans to help choose this year’s squads. The Freedom Division roster will include seven players from the Lancaster Barnstormers. Six players from the Southern Maryland Blue Crabs (including pitcher Daryl Thompson, who was selected but will not participate in the game due to injury), five players from the Sugar Land Skeeters and five from the York Revolution were chosen. The Freedom Division will be led by York Revolution manager Mark Mason, who will be managing in the All-Star Game for the first time after leading the Revolution to the Atlantic League Championship in 2017. The Liberty Division roster features seven players from the host Long Island Ducks. Additionally, six members of the New Britain Bees, five players with the Somerset Patriots and four members of the Road Warriors were also selected. The Liberty Division will be guided by Long Island Ducks skipper Kevin Baez, who will be managing for the third time in the Atlantic League All-Star Game (2012, 2013). He led the Ducks to their second consecutive Liberty Division Championship in 2017. The Atlantic League’s 21st Annual All-Star Game will be held at Bethpage Ballpark, the home of the Long Island Ducks, on Wednesday, July 11th. First pitch is scheduled for 6:35 p.m., with the ballpark gates opening at 5:00. The All-Star Game will be preceded by the Digmi Home Run Derby, showcasing many of the league’s top power hitters. Fans will also enjoy in-game entertainment from the highly-acclaimed Bucket Ruckus and Tyler’s Amazing Balancing Act. Following the game, all of those in attendance will be treated to the biggest Fireworks Spectacular of the season.